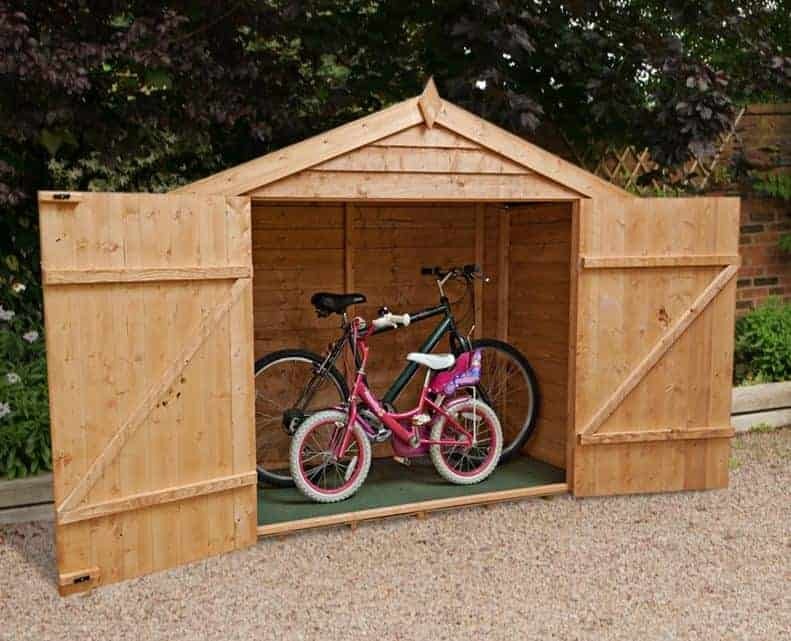 You can forget rusted chains, squeaky breaks or the children’s bikes left all over the lawn when you place the 7 X 3 Windsor Overlap Wooden Bike Store / Shed in your garden. 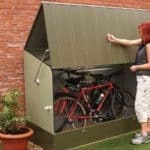 Made with real style, this bike store would be a fantastic addition to any type of garden and also serve a great purpose. Keeping your bikes safe, dry and making sure they stay in great shape is the idea of this bike store. Best of all is that it does it in such a great and modern design that you will actually love to have this as part of your garden. Made from some very good materials, this is a bike store which has a very stylish look and is also one that is going to serve you very well for a lot of years. Windsor have used overlap cladding and an apex style roof to maximize the bike stores ability at keeping out the rain. Everything you place inside here is going to be kept dry. A strong frame ensures that the bike store can take a bit of wear and tear, so for families or even just a person who wants a good looking place to keep their bike, safe this would be the perfect bike store. 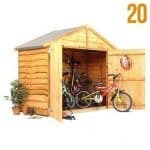 The Windsor Overlap Wooden Bike Store / Shed is something that from the moment we saw it, we knew would be something that we were going to like and that would fit into any style or size of garden. 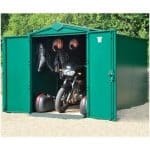 Plus, despite the fact that this is referred to as a bike shed, we are sure many people will purchase this and use it for other types of storage. The width of the bike store is a very impressive 6 feet 7 inches with 2 feet 9 inches of depth. Windsor themselves say that this is enough space to fit in two adult sized bikes, but we actually feel that you could get a few more items in here as well with some clever use of the space available. The height is 5 feet 8 inches at the ridge and 4 feet 3 inches at the ridge. The whole structure has this very secure and strong feel and look to it so you will always feel confident locking your bikes or other belongings up in here. For the roof, Windsor have made the decision to make a real feature out of it. This is an apex style roof which looks very nice, but it is also ideal for a bike store as it will make it so no rain can get inside and rust your bike. The roof is made from solid board sheeting and has a mineral felt roof. This kind of boarding is strong; strong enough to take the weight of a good few inches of snow in the winter. This is a good and reliable roof which manages to look great, but also serve as a first rate protection against the rain. We really do love the way the overlap cladding on the bike store looks as it gives it a real stylish look. Windsor have made great use of this 8 mm thick cladding to ensure that no rain is going to be able to sneak inside, no matter what direction the wind or rain is hitting the bike store from. Overlap cladding is all about keeping the bad weather outside so you will never have to worry about anything getting ruined that you place in here. The cladding really does give this such a high quality look, so much so that we are sure more than a few people will think the low price is a mistake. While in the early days we are sure most people will be placing their bikes into the bike store with some real care to avoid damage, before long, you will be slinging your bike in there as quickly as possible. Well thanks to the strong, sturdy and well made frame this is not an issue. The frame is a very impressive, 18 x 28 mm and this is so durable that it can take a bit of abuse over the years and not lose any of its strength in the process. So while the cladding may have a lovely appearance to it, it is good to know that it has a reliable and powerful backbone of a frame keeping it all together. For the floor, Windsor have gone with that same type of boarding that is in the roof. This 8 mm thick, solid sheet floor is more than strong enough to be able to take the weight of a few bikes and also the added pressure of the kids no doubt throwing their bikes inside after you tell them to pick them up off the lawn. What we love about the floor is just how ideal it is for a bike store. Windsor clearly knew that this floor would be covered in mud, grass and whatever else you ride through. So with that in mind they made sure to use a flooring that is more practical than pretty. Which keeps the bike store lasting a long time, but also helps keep the costs down. Windsor will dip the bike store in treatment before it is delivered, but they do recommend (and so do we) that you treat the bike store as soon as it has been built. To really maximise the life of the bike store it is best to give it a good coat of treatment once per year. This keeps it looking good, but also gives the wood a helping hand in staying strong. One thing that we really love about Windsor sheds and bike stores is that they give you a ten year anti rot guarantee. Now this is dependent on you treating the bike store, but this is something you should be doing anyway so we feel it is a reasonable requirement to make sure the warranty is valid. We know that getting a bike inside a shed with a single door is a very frustrating experience and will most likely end in you just dumping your bike on the garden floor. But as this was built with storing bikes in mind, Windsor have put a very large double door on here. The door offers you 4 feet 11 inches of width which is more than most adult bikes and it is 4 feet high as well. This is more than enough room to get your bikes inside here without any trouble at all. Each door is held in place with two good sized and long lasting hinges. The bike store also comes with two clips to keep the doors from blowing open in the wind. There are no windows on The Windsor Overlap Wooden Bike Store / Shed, but when you consider that you are trying to keep your bikes safe and secure, people not being able to see what you have in here is not a bad thing at all. 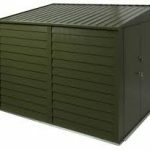 This is a very sturdy and well built bike store, but if you really want to make sure that your bikes are kept safe and secure then you will want to add a padlock or some other kind of lock to the doors. This is very easy to do and can be done for as little as a pound. It is something that we recommend you do as it does give you just that little bit more peace of mind when you store away your bikes. With the doors closed tight and with an added padlock this is as private as you can get. There is no way to be able to see inside the bike store once the doors are closed. We know that some people do like to give a shed or a bike store their own personal touch. A couple of ways that you could do that here are adding some shelving to the back wall or perhaps using a wood treatment that is coloured. Windsor have used some very good materials here that give the bike store a very impressive and high quality looking appearance, but at the same time do not make the cost of the store go through the roof. We are very impressed with the materials that have been used here. 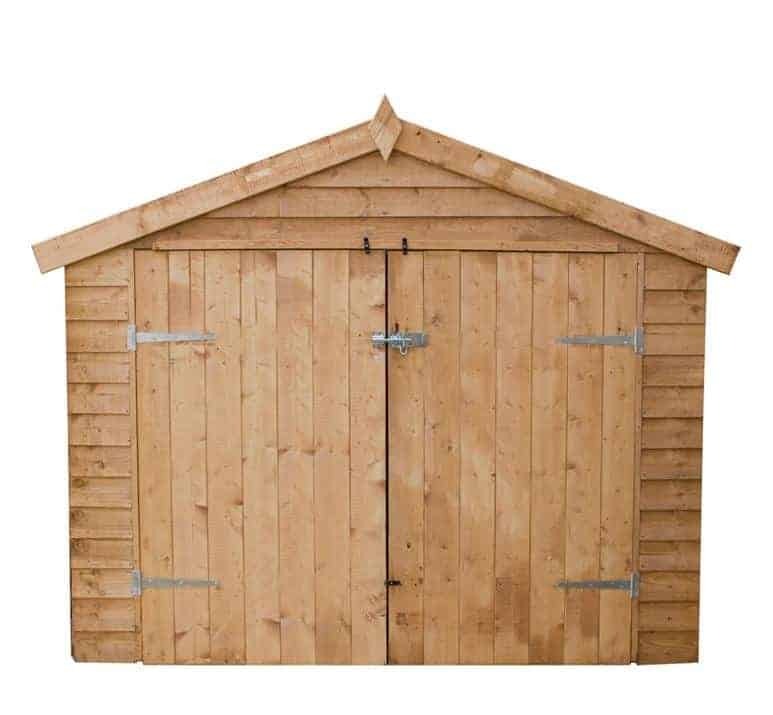 Strong cladding, a good roof and reliable floorboards mean this should be a bike store that is going to be part of your garden for many years. By fitting in at least two adult bikes or even more if it is used to store kids bikes, we feel this is a good sized bike store. As well as serving as an area to keep your bikes safe, you could use this as a storage space for various tools or gardening items and still have a good amount of space to play with. This is a two person job and it will take somewhere in the 1-3 hour time frame to build. Of course this depends on your DIY skill level, but we feel as long as you follow the instructions you will have this up before you know it. 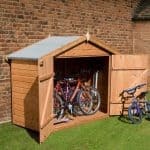 Final Thoughts: At £179.99 The Windsor Overlap Wooden Bike Store / Shed offers you a high quality storage space to keep your bikes safe from the weather. Or if you are a family it saves you from tripping over your kids bikes, which we all know end up left on the lawn each night. 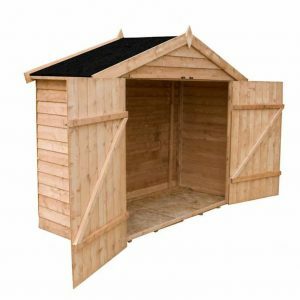 It offers a very generous amount of storage space for the price and we feel that it would also serve a person well as a shed for storing other items. We were very impressed the first moment we saw this bike store and we think that for the price and the high quality, you will be as well.